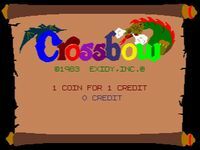 Crossbow is a video arcade game released by Exidy in 1983. It was later published by Absolute Entertainment for the Commodore 64, DOS and by Atari for the 2600, 7800 and XE Game System starting in 1987. Crossbow was the first arcade game with fully digitized sound and speech (some earlier games such as Journey used a loop tape for music and speech effects). It also featured some of the most advanced graphics of the time. Unlike other gun games, such as Operation Wolf (released four years later) that used a positional gun, Crossbow featured an optical light gun. The game's light gun resembled a full-sized crossbow. Some complained that it was heavy and difficult to aim. This game can be played with the MAME video game emulator, using a mouse instead of the crossbow-shaped light gun. Source: Wikipedia, "Crossbow (video game)", available under the CC-BY-SA License.